With cold and flu season upon us already this is something that is really helpful and quite easy to do. The practice of saline nasal wash or lavage (called Neti in the yoga tradition) is a time honored folk remedy for a variety of respiratory complaints, as well is a simple and effective tool for maintaining nasal health. The technique is simple, and if practiced correctly, provides gentle and immediate relief of nasal congestion. The keys to comfortable nasal lavage are concentration and temperature. The solution should have the same salt concentration as your tears (0.9%) and be warmed to normal body temperature or a bit warmer. If the salt concentration is too low or too high, the experience can be very unpleasant (like getting water up your nose when you are swimming). Water that is too cool will cause the nasal membranes to swell, defeating the purpose of the wash. Water that is too hot will burn the sensitive nasal mucosa. The solution should be prepared with water and a pure, non-iodized salt. Canning and pickling salt is pure (99.95% NaCl), cheap, and readily available (you can buy it at any supermarket that carries canning supplies). Kosher salt is an acceptable alternative, as well as sea salt. The amount of salt you need to add will depend upon both the volume of water you use and the texture of the salt you select (the coarser the grind, the more you need). Pour about 1/2 cup of this solution into a Neti pot or squeeze bottle. 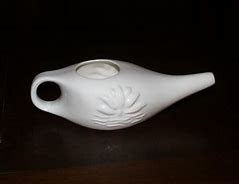 (A Neti pot is a small ceramic vessel, shaped like an Aladdin's lamp that is specifically designed for nasal lavage. Neti pots are available in some health food stores and yoga supply shops. Bending over a sink, hold the spout to one nostril, tilt your head and pour the solution through so it flows out the other nostril. After rinsing, gently blow the loosened mucus out and repeat as needed. If you prefer, the same solution can be used in a spray bottle. It may be very difficult to get past the initial revulsion and fear of choking, but once tried it can be both comfortable and soothing.